Located in the Hither Hills area of Montauk, the 1.2 acre wooded site has a sloping topography falling 30 feet from north to south. The long thin property has restrictive setback requirements due to the width of the property and the paper-road along the western border. The program is to create a 3,200 sq. ft. residence including a courtyard, pool, outdoor kitchen, screen room and trellis. 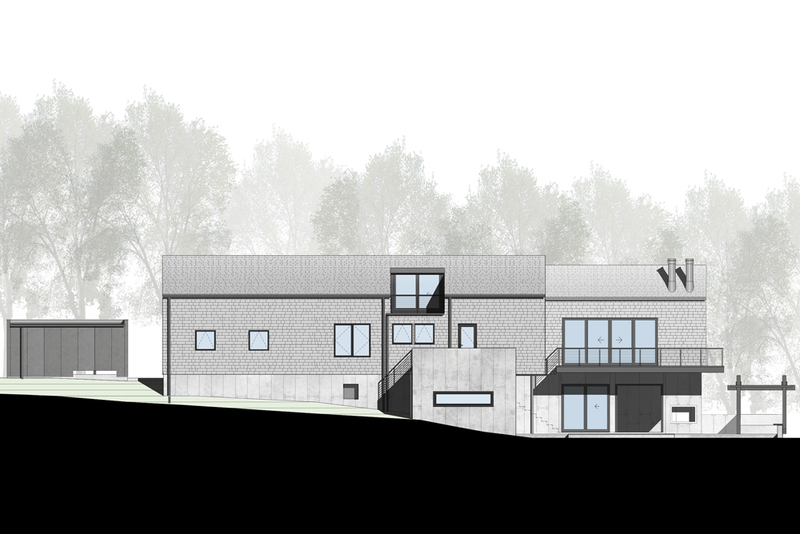 The design situates 2 gabled volumes built into the slope of the hill and shifted to create upper and lower levels. The driveway ascends along the eastern property line to the upper Entry Courtyard and Garage. The formal Entry to the house is placed between the 2 volumes with views thru to the forest beyond. 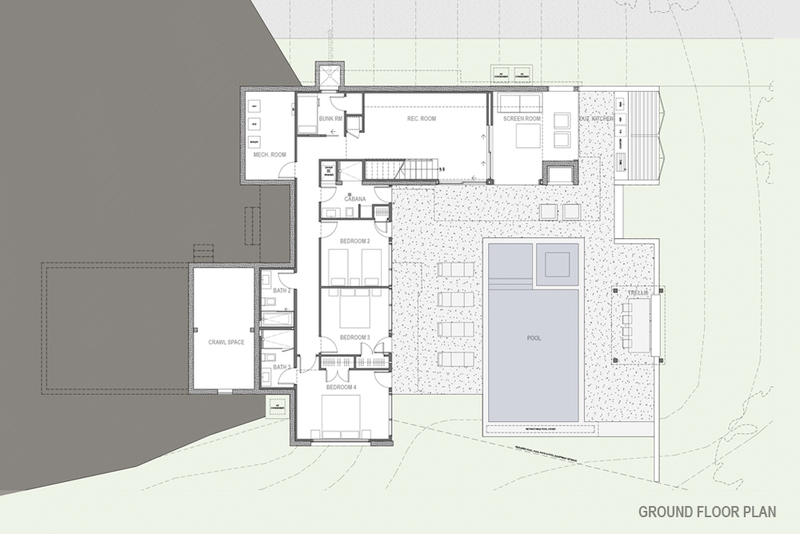 The eastern volume is a continuous open space that houses the Dining Room, Kitchen and Living Room spaces. A cantilevered deck off the Living Room extends over the courtyard below. The larger western volume contains the Master Bedroom Suite that faces south and also cantilevers over the lower Courtyard. The remaining area contains a Guest Bedroom, Bathroom, Laundry Room and Garage. 4 additional Bedrooms and the recreational living spaces surround the lower Courtyard, including a Media Room, Screen Room, Trellis, outdoor Fireplace and Kitchen. The house will be clad in a natural 1 x 10 Ash board & batten rain-screen siding system with galvanized metal standing seam roofs. 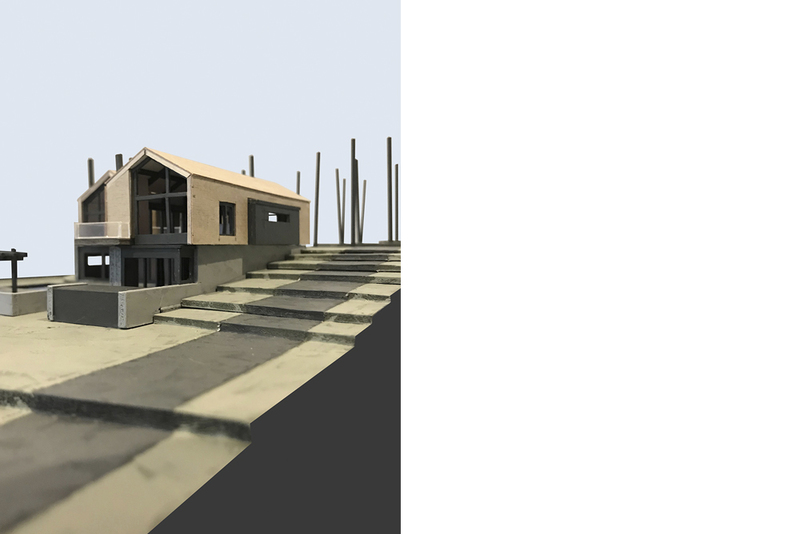 The lower level will be exposed concrete and exterior bluestone patio. Construction will begin in the spring of 2018.